It is so important for safety that teens don’t text and drive. Of course, actions speak louder than words, so we must begin to educate our teens by not texting and driving ourselves. That is probably not enough alone. We need to talk to our teens about texting and driving and they need to understand that we are serious and consequences will follow their actions. Defensive driving is important and they can’t do it if they aren’t aware of their surroundings. I suggest educating your teens to the dangers of texting and driving as a starting point. 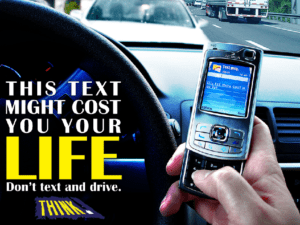 The National Highway Traffic Safety Administration reports that in 2010, more than 3,000 people were killed and an additional 416,000 were injured due to distracted driving, which includes texting while driving. According to a new, national survey conducted by the Ad Council, thirty-four percent teen of respondents said that they never text while driving. What about the other 66% of teens? That means 66% of teens surveyed are engaging in at least occasional texting while driving. So if you think your child doesn’t text while driving, it is worth a talk to make sure that they don’t! “Texting and driving is an epidemic on America’s roadways, but these crashes are preventable. Distracted driving does not just happen, it’s a choice,” said U.S. Transportation Secretary Ray LaHood. Once your teen understands the dangers of texting and driving make sure they understand the consequences too. A few seconds of carelessness could have a devastating impact on their life and the lives of others. Texting while driving not only jeopardizes the safety of themselves and others, but it can also violate state motor vehicle laws and result in hefty fines or loss of driving privileges. Want to take it a step beyond talking? Well, there is a new new public service advertisement on YouTube featuring scenes from season three of Fox’s award-winning television series “Glee” to educate young adult drivers on the dangers of texting while driving. It may be the visual aid you are looking for to demonstrate to overconfident young adult drivers that it is not safe to text while driving. Have that talk and make sure your teen gets where he or she is going! Also, I have heard there are apps that can prevent kids from texting while they are driving. You might want to look into that if your teen has that kind of cell phone! This is one of my big worries as my kids get closer to driving. Thanks for posting.